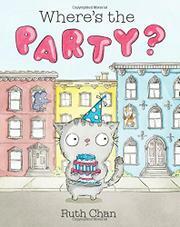 Georgie the cat is eager to throw a party—but none of his friends can come! Bummer. Georgie, a true party animal, wakes up with “the best of best ideas” and rushes out to buy a cake and make the rounds of his friends to deliver invitations. But…floppy-eared Feta the dog (“his go-to party pal”) is too busy making pickles, Lester the rat is in the middle of untangling a string of lights, shy Ferdinand the mole feels like staying in his storm drain, and all of Georgie’s other animal friends present similarly weak excuses. In simply drawn cartoon illustrations, Chan tracks her increasingly discouraged kitty through a long day that dims into night. By the time the streetlights come on he is out of friends (and, being a nibbler, also out of cake) and so wanders wearily home—to a big, bright, joyous “SURPRISE!” that his friends had been preparing all along. The story is slight, repetitious, and predictable, but Georgie is pretty doggone adorable, and Chan makes up for its narrative simplicity with plenty to look at, playing with perspective and lighting to emphasize Georgie’s increasing dejection.